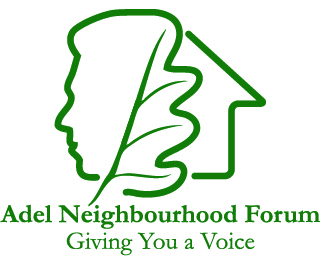 Ian Bond, the Co-Chairman reports that the Forum has now arranged a new series of consultation meetings to finalise the Adel Neighbourhood Plan on land development and related issues. These are important meetings on land development in Adel for the next 20 years. Please come and give your views to Members of the Neighbourhood Forum and Councillors Barry and Caroline Anderson. The AGM of the Cookridge Gardens Estate Association (residents in Whinfield, Broomfield, Heathfield, The Drive, The Crescent and parts of Otley Road, Holt Lane and Farrar Lane) takes place at 2pm on Saturday the 24th September at the Friends’ Meeting House on New Adel Lane, LS16 6AZ. A key part of the meeting will be Councillor Barry Anderson setting out the latest position and proposals for the Adel Neighbourhood Plan. This is a great chance for residents to see the proposals, give your views and chat to members of the Adel Neighbourhood team. After the consultations we will seek advice from Leeds City Council before submitting it to an independent Inspector. Once agreed by the independent inspector it will go to a referendum of Adel residents. We need 50% of those who vote in the referendum to approve the plan.